City and UCSC GreenWharf initiative receives the 2014 Governor's Environmental and Economic Leadership Award! 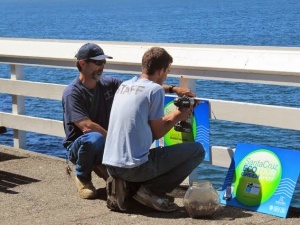 In recognition of a multiyear collaboration between the City of Santa Cruz and the University of California, Santa Cruz, the GreenWharf partnership has been recognized with the 2014 Governor's Environmental and Economic Leadership Award. Representatives from the City and campus accepted the award at a ceremony on January 21st at the California Environmental Protection Agency in Sacramento. 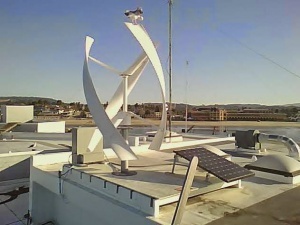 In 2011, the City and UCSC created the GreenWharf program to foster the development and incorporation of innovative technology into the structure and operations at the Santa Cruz Wharf. GreenWharf has gained momentum and now involves a number of nonprofits, Wharf businesses, private sector entities, students, and interested members of the public. These parties are collaborating on interrelated projects that minimize the environmental impact of Wharf operations while enhancing its appeal as a visitor destination. "We are honored to receive this recognition," said Ross Clark, Climate Change Action Coordinator with the City of Santa Cruz. "Our community is committed to economic progress with resource conservation and environmental considerations always at the forefront." The GreenWharf partnership also supports the City's and UCSC's Monterey Bay Climate Action Compact pledge to reduce municipal greenhouse gas emissions 30% by 2020 from a 1990 baseline.